Yesterday I shared why being a PODCAST GUEST is one of the BEST ways to move your business into sold-out status. But… there is a right way and a WRONG WAY to pitch yourself as a guest. Trust me, I’ve seen some fantastic pitches and I’ve seen some disasters. Fantastic = airtime, disasters = delete. Let’s get you in that fantastic zone, shall we? I’d love to be a guest on [insert show name [to add value to your audience. Of course, I’ll happily promote our interview to my audience as well. Include your bio along with links to your website so the podcast owner can check you out. They want to see if your vibe connects with them/their audience. Include hyperlinks to any other podcast, guest blog or other appearance where you’ve been featured. Ugh. If you do NOTHING else, PLEASE invest in audio equipment! I had a few interviews I had to throw away because the guest had TERRIBLE audio quality. Most podcasters do interviews via Skype, so make sure you have a good internet connection. :: Take off any noise-making jewelry (like bracelets) that can be incredibly distracting and annoying! :: Shut down any internet using applications during your interview so Skype has the best chance to actually work. I invested in a Blue Yeti mic because I was doing my own show for 18+ months. You don’t have to invest at that level, but I do suggest at the very least getting a headset from Amazon or your local electronics store that will give you great audio quality. Most podcast owners will want to use their own online calendar, but I include mine for simplicity in case they’d like to simply schedule a time, which happens about 20% of the time. Thanks so much! I look forward to connecting soon. I’ve used this exact template to be a guest on some of the TOP podcasts out there (and just last month I pitched myself to 30 more podcasts… so stay tuned for even more shows from me). Get your Free Podcast Guest Pitch Template! Use this free template and get out there are start picthing yourself! This is awesome advice! I talk a lot about the benefits of being a podcast guest in my new book, Pod Castaway (http://podcastawaybook.com). I also wrote a popular post last year on How To Be The Perfect Podcast Guest (http://goforlaunch.io/become-perfect-podcast-guest). I love your idea about including audience numbers and suggested topics when approaching podcast hosts. Like you, I am amazed at some of the terrible pitches I get as a podcast host. I can tell when someone hasn’t really listened to my show or taken the time to understand the types of guests I am looking for. Being a great podcast guest is a fantastic way to promote yourself and your business—if you do it correctly. Brandon, thanks for your comments! Looks like we’re on the same page with our views of guest pitching. 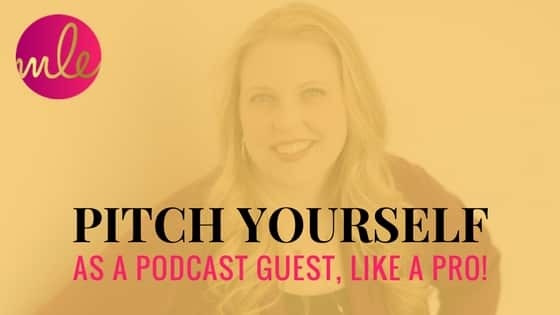 As host of the podcast Smashing the Plateau, with over 150 guests, I can tell you that your straightforward and informative approach is the way to let hosts know about your expertise and interest in being a guest. Thanks David – and thanks for having me on your show too. You’re putting great work out into the world. Question: What is the best way to contact podcast hosts? I have a well crafted e-mail, but I would be happier if I could make contact by phone before sending it. Is that the best way? Is there a best e-mail address Is there a way to find phone numbers? I just wanted to say thank you so much for this, Michelle! I had been kind of nervous about pitching myself to podcasts (even though I know how important it is! ), but reading your steps made it seem so much easier + doable. I just sent my first pitch today! Katie – I’m thrilled for you! Let me know how it goes – I always like to celebrate business owners getting out there with their story to reach and help more people. Doing a happy dance for you! Thanks for the great tips. Just hearing your template ideas was a great help, but then to have examples of each really took the cake. Glad you got a lot out of it Beckett! Episode 73: What’s Your Business’ Likeability Factor?